Farrar, Straus and Giroux (BYR), 9780374301347, 272pp. Just when they think they've got the hang of things, Rip and Red find that fifth grade continues to challenge them in head-spinning ways. Tiki, a new girl whose Egyptian dad is an animal-rights activist, has just joined their class. She's charismatic, funny—and she's got game! 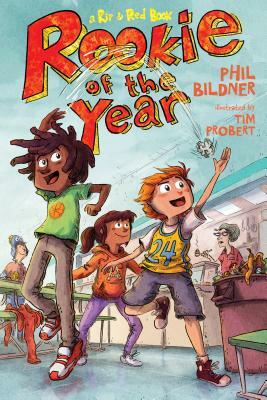 Rip has his world turned upside down as Tiki proves to be tough competition on the Clifton United basketball team and leads a rebellion against the lousy new food service in the school cafeteria. Red—a kid on the autism spectrum—is struggling with the upheavals as well. But as these two funky and funny best friends discover, sometimes radical change is the right move, on the court and off. Phil Bildner is a former New York City public school teacher who lives in Newburgh, New York. The author of many books, including Marvelous Cornelius: Hurricane Katrina and the Spirit of New Orleans and The Soccer Fence: A Story of Friendship, Hope, and Apartheid in South Africa, Phil is a frequent speaker at conferences and travels to over sixty schools a year. Tim Probert has illustrated children’s books, including Pickle by Kim Baker, as well as magazines and advertisements. He is also a director at the animation studio Aardman Nathan Love. He lives in New York City.